There is clear-cut evidence that, for a period of at least one year, supervision which increases the direct pressure for productivity can achieve significant increases in production. However, such short-term increases are obtained only at a substantial and serious cost to the organization. To what extent can a manager make an impressive earnings record over a short period of one to three years by exploiting the company’s investment in the human organization in his plant or division? To what extent will the quality of his organization suffer if he does so? The following is a description of an important study conducted by the Institute for Social Research designed to answer these questions. The study covered 500 clerical employees in four parallel divisions. Each division was organized in exactly the same way, used the same technology, did exactly the same kind of work, and had employees of comparable aptitudes. Productivity in all four of the divisions depended on the number of clerks involved. The work entailed the processing of accounts and generating of invoices. Although the volume of work was considerable, the nature of the business was such that it could only be processed as it came along. Consequently, the only way in which productivity could be increased was to change the size of the work-group. Turning now to the heart of the study, in two divisions an attempt was made to change the supervision so that the decision levels were pushed down and detailed supervision of the workers reduced. More general supervision of the clerks and their supervisors was introduced. In addition, the managers, assistant managers, supervisors and assistant supervisors of these two divisions were trained in group methods of leadership, which they endeavored to use as much as their skill would permit during the experimental year. For easy reference, the experimental changes in these two divisions will be labelled the ‘participative programme! D. exploit the human organization of a company in order to increase profits. C. had identical patterns of organization. Complete the summary below. Choose ONE word from reading passage 123 for each answer. 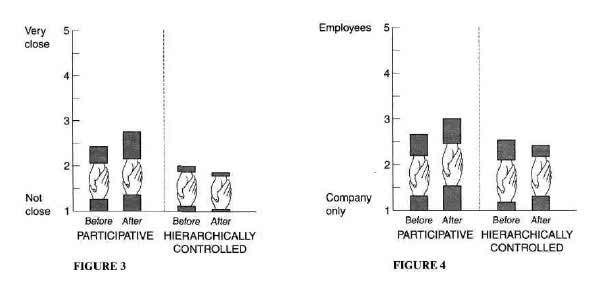 This experiment involved an organisation comprising four divisions, which were divided into two programmes: the hierarchically controlled programme and the participative programme. For a period of one year a different method of ....... 31 ....... was used in each programme. Throughout this time ........ 32 ........ was calculated on a weekly basis. During the course of the experiment the following changes were made in an attempt to improve performance. • the work force was ...... 36 ...... by 25%. Look at Figures 1, 2, 3 and 4 in reading passage 123.